The social dilemmas faced by present-day Native Americans are revealed in this journalistic look at a high school girls' basketball team in Crow, Montana. In a previous book, Goat Brothers (1993), Colton examined the lives of fraternity brothers from the 1960s to the 1990s. Here, he spends a season living and observing the Hardin High School girls' basketball team, a team comprised of white girls and Crow Indians. Although Colton manages to give a face to the different players, he is particularly fascinated by 17-year-old Sharon Laforge, an extremely talented American Indian who hopes to earn a college basketball scholarship, but whose future is threatened by several factors, including an absentee father, an alcoholic mother, a possessive and abusive boyfriend, an undisciplined lifestyle, and pressure from peers and community. The racial oppression that Native Americans still face, especially in small rural towns, is another factor. Hardin's population of 2,990 is 49 percent Crow Indian, and mistrust and misunderstanding exists between cultures: the Crows see the whites as having inherited privilege, and the working-class whites see the Crows as having access to government funds, services, and scholarships that they themselves cannot get. In addition, the emerging status of women, especially star athletes such as Sharon, threatens the downtrodden and jealous Crow men who traditionally are used to being in charge. 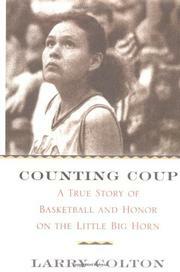 "Counting coup," an Indian battle term that referred to warriors gaining honor, respect, and dignity, is now also a Hardin High School basketball term that refers to dominating one's opponent. In this Hoop Dreams for American Indians, Colton shows how a handful of girls try to count coup against opponents who appear on more than just the basketball court. Colton's account of the environment he witnesses, while not particularly enlightening, does provide good dramatic background for his story of the team's attempt to make, and win, the state championship.